I’ve been putting off writing a blog entry. Actually, I’ve been putting off a lot of things. Not because I don’t want or need to do them. Or because I’m actively avoiding them. I just have entirely too much to do. I seem to always have too much to do. I like to think of myself as strong, independent, a “super” person, if you will. I like to believe that I can do everything. By myself. Perfectly. On time (early if possible). I like to think that I alone can be the person to do everything. For everyone. All the time. Most days I have no idea how I even managed to drag myself out of bed, let alone put one foot in front of the other to make it out the door. Most days I do. I somehow manage to get the kids off to school and daycare, dressed and fed. I manage to make it to my classes, taking notes and tests, writing papers and getting good grades. Somehow I manage to get children to activities, dinner on the table, my house fairly clean and still standing. I struggle to fall asleep against the thoughts that I’m not good enough. That I’m not doing enough. That I should be doing better. That I’m failing. I don’t honestly believe that there is a level where would feel like I was doing enough. 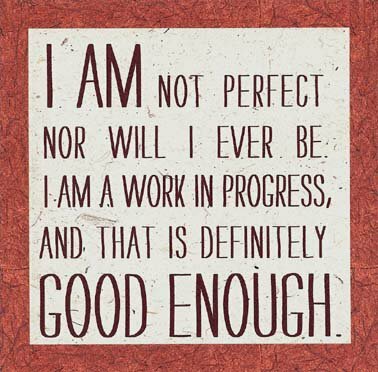 My perception of “good enough” knows no ceiling. I see those around me beating themselves up for not being good enough, for not being where they’d like to be. I see them continue to work towards their goals, despite significant struggles and barriers. I see them become frustrated with their perceived lack of progress, when I see that they are moving forward, though likely not at the pace they had hoped. I see those around me doing the best they can. I see them dealing with sick children, failing relationships, insufficient incomes, lack of transportation, health issues… I see them at class. I see them in the halls of our children’s school and in the waiting rooms of dance lessons, doctor’s offices and counseling centers. I see them continuing to try. They could give up. They could let themselves be swallowed by the brokenness of our society and the systems within it. But every day they get up and they continue to try. They are doing the best they can. And even if they don’t believe it themselves, I see they are good enough. I see they aren’t failing. I see that, however tiny the steps, they are moving forward. I’m not failing by anyone’s standards but my own. I’m doing the best I can. This entry was posted in Keep It Simple and tagged honesty on March 12, 2013 by Lyndsey.